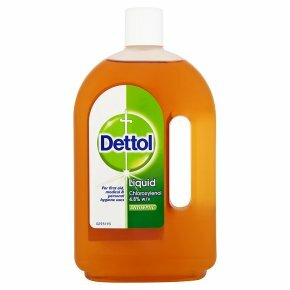 How to use Dettol Liquid: For applicationto the skin. Wound cleansing: Wash the affected area with two and a half teaspoons (12.5ml) of Dettol liquid diluted in 1/2 pint (1/4 litre) water. Cover with dry gauze or lint. Personal hygiene/douching: When medically advised: Two teaspoons (10mls) in 2 pints (1L) water. Dandruff: One tablespoon in 1pt (1/2 L) warm water. Pour over scalp. Leave for 10 mins before shampooing. Spots and pimples: One tablespoon (15ml) in 1/2 pt (1/4 L) of warm water. Bathe affected area daily. If contact is made with the eyes, wash them thoroughly with cold water. If swallowed, wash out mouth and drink plenty of water or milk. In both cases, consult a doctor and take this bottle with you. Possible side effects: If you have any side effects after using this product, talk to a pharmacist. Reporting of side effects: If you get any side effects, talk to your doctor, pharmacist or nurse. This includes any possible side effects not listed in this leaflet. You can also report side effects directly via the Yellow Card Scheme at: www.mhra.gov.uk/yellowcard. By reporting side effects you can help provide more information on the safety of this medicine.